JACOB MARLEY, THE RUEFUL GHOST of Dickens’ A Christmas Carol, refers to the manacles and links that trail behind him as “the chain I forged in life”, and indeed, as the years wear on, one can certainly feel the accumulated weight of one’s own “ponderous” train, its clanking amplified to even greater force during the holiday season. Certain cycles of the year speak louder to our memories than others, whether they mark anniversaries of loss, joy, sacrifice, devotion, or any other emotional life trophies. And the visual arts, including photography, tap into and amplify these feelings in everything from the pages of the calendar to snapshots of dear ones both present and absent. Both present and absent. Living and dead. Still here and almost gone. Ghosts and survivors. Marley and Scrooge. The photographer can sometimes almost feel the collision of past and present within a single image, as if each force is grappling for control of the picture’s message. In the above photograph, I was initially looking to steal a candid of my father as he watched some television. It should have been a simple task, but, when your father is still here at 88, the faces of those no longer here echo in his every feature. 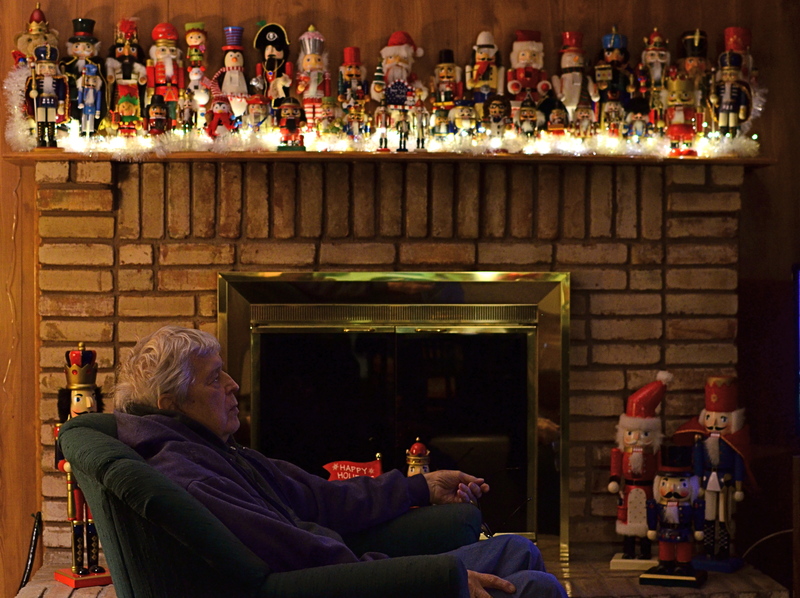 To add to the density of emotion, you have the fact that he’s seated beneath a mantle fairly buckling under the weight of a third of a century’s worth of well-curated nutcrackers. Thus, even though she’s dodged having her picture taken at this particular moment (a well-honed skill), my mother is present here as well. And so, decisions, decisions: I could have made my father look over in my direction, maybe even coaxing a smile from him, but I liked his weary look of detachment, as if the years were a kind of Marley chain dragging him earthward. I also could have cropped out the nutcrackers, simplifying the overall frame. But the “ponderous” tonnage of memory the figures symbolize would have been wasted, so they stay. Photographs can only rarely be snapped in their most complete form, and certain times of year prove too layered with history to make for so-called “simple” pictures. Maybe it’s the different way we see on certain days. And just maybe it’s a ghostly presence, a glimpse of the chain we forged in life. This entry was posted on December 16, 2017 by Michael Perkins. It was filed under Christmas, Conception, Frame and was tagged with Holidays, sentiment, snapshot.